The Maranao people (Maranao: ['mәranaw]; Filipino: Maranaw (based on Papanoka Mera)), also spelled Meranao, Maranaw (based on Marapatik) and Mëranaw, is the term used by the Philippine government to refer to the southern tribe who are the "people of the lake" (Ranao in the Iranaon language), a predominantly-Muslim region of the Philippine island of Mindanao. They are known for their artwork, weaving, wood, plastic and metal crafts and epic literature, the Darengen. Modern-day Maranao sultans from Lanao. 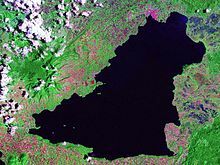 A satellite image of Lake Lanao. The word Maranao is a misnomer as it does not have a sense in reference to nouns such as people, places or things. The prefix Ma- means 'to be', i.e., Maranao means to be a sea. Alternatively, the word Maranao may be a portmanteau of "Malay" and "Lanao" or Sea Lanao thus making it "Maranao" which means people living around Lake Lanao). Further, "Meranao" is referring to "Lake goer." The lake goer called as Maranao in due time settlements of the "Pat a Pongampong a Ranao" or "Four Genealogical Division of Lanao" by four descendants namely "Batara a Kilatun" of Masiu, "Dimaampao Kalinan" of Bayabao, "Butuanun Kalinan" of Unayan, and "Bato Lokongan" of Baloi. The proper term is Iranon (also Iranun) which means "People of the Sea", referring to the indigenous people who inhabited the lands around the lake. The Maranaos are part of the wider Moro ethnic group. The ancient people in Mainland Mindanao were called Iranun, also spelled Iranon, of the coastal area of Illana Bay (Ilian in Maranao) and Iranaon (the people in Bembaran/ Bumbaran or Bukidnon and Kiaranda a Ragata Tiongcopa Layagen, in local language). Volcanic activity developed a flat land surface little-by-little. Modern science describes this process as sedimentary formation and residual remains that forms the low and flat land surface in the coastal areas. This land is rich and suitable for agriculture. The Maranao vernacular called it “ira” which means "remains". Thus, the name of the people in the coastal area of Illana Bay is another portmanteau of “ira” plus “ranao” or people living in the remains in the coastal areas. In present days, the Maranao use the word to refer to “tao sa ragat”, the people of Lanao who migrated to sea area while the Maranaos are people who stayed around the lake. They share lineages, culture, bravery, (i.e. Gandamatu sa Ranau a Tombaga sa Macadar, wadiya lantay decritan potaw dipagotngan, phagrom sa kinikhid, khansa batobarani) and history. They are called Maranao as a general term. A food jar (gadur) made of brass with silver inlay. The culture of the Maranaos is centered on Lake Lanao, the largest in Mindanao, and the second-largest and deepest lake in the Philippines. This lake is the subject of various myths and legends. It supports a major fishery, and powers the hydroelectric plant installed on it; the Agus River system generates 70% of the electricity used by the people of Mindanao. A commanding view of the lake is offered by Marawi City, the provincial capital. Prior to the usage of the Arabic style merged with Modernist style common in mosque architecture in the Maranaos today, the mosques of the Maranaos used to be the vernacular hut-style and Pagoda-style, which were common until the late 19th century. Maranao is an Austronesian language spoken by the Maranao people in the provinces of Lanao del Norte and Lanao del Sur. Because of the mass influx of Cebuano migrants to Mindanao, many Maranaos are also fluent in Cebuano. Arabic, a Central Semitic language, is spoken by a minority of the Moro people, as it is the liturgical language of Islam. Most Maranaos, however, do not know Arabic beyond its religious use. Chavacano (sometimes spelled as Chabacano or Chabakano) is a Philippine Spanish Creole that gained popularity as a major language during the short-lived Republic of Zamboanga. Most Maranaos with part-Tausug or Yakan from Zamboanga and Basilan are conversant, specifically the Zamboanga dialect known as Zamboangueño. Sarimanok, Papanoka "Mra" or "Mara patik" is a legendary bird of the Maranao that is a ubiquitous symbol of their art. It is depicted as a Hoodhud (Arabic) with colorful wings and feathered tail, holding a fish on its beak or talons. The head of Sarimanok is like the head of a Hoopoe (Balalatoc in maranaw) and is profusely decorated with scroll, leaf and spiral motifs. It is a symbol of good fortune. The Maranao have also developed their own adaptation of the Ramayana epic, the Maharadia Lawana. They also have a traditional dance, the Singkil, which was based on another local Ramayana adaptation, the Darangen. A Kulintang ensemble at the National Museum of Ethnology in Osaka. Maranao kulintang music is a type of a gong music. Sarunaayfis also found among both Muslim and non-Muslim groups of the Southern Philippines. Kobbing is a Maranao instrument and Biyula is another popular Instrument. Biyula is a string instrument. In 2005, the Darangen Epic of the Maranao people of Lake Lanao was selected by UNESCO as a Masterpiece of the Oral and Intangible Heritage of Humanity. Maranao cuisine is quite spicy, with spices mixed up. Traditionally cultivated spices, locally known as palapa (Bontang, native product in Gandamatu) are a common condiment. It is made of stewed scallion bulbs or “sakurab” in Maranao. Thinly sliced scallion bulbs and ginger are caramelized by slow cooking and mixed with chilies and coconut oil. Dishes are intertwined with important cultural rituals across all aspects of Maranao culture: from birth to death.! Traditionally, the Maranao society is divided into two strata. Namely, Mapiyatao (Pure) and Kasilidan (Mixed blood). Kasilidan is further subdivided into categorlies which are as follows; Sarowang (Non-Maranao), Balbal (Beast), Dagamot (Sorcerer/Sorceress) and Bisaya (Slave). The Mapiyatao are those natives who are entitled to ascend to thrones and has a pure royal bloodline. On the other hand, the Kasilidan are those natives who are suspected of mixed bloodline. However, due to the changes brought by time, these social strata are beginning to decline due to the rise of wealth of each and every Maranao families. The Maranao people are shown in chocolate brown in this map. Maranaos number about 1,720,000. Along with the Iranun and Maguindanao, the Maranao are one of three, related, indigenous groups native to Mindanao. These groups share genes, linguistic and cultural ties to non-Muslim Lumad groups such as the Tiruray or Subanon. Maranao royals have varied infusions of Arab, Indian, Malay, and Chinese ancestry. As with other Indigenous and Mindanao Lumads, during the nominal occupation of the Philippines by the Spanish, and later the American and the Japanese, the Maranaos had tribal leaders whom they called Datu. In the 14th century, upon the arrival of Islam, they developed into a kingdom with a Sultan due to the influence of Muslim missionaries. Mamintal A.J. Tamano was a Filipino statesman and a former Senator of the Philippines. Adel Tamano is a Filipino educator, lawyer and former politician. Ansaruddin Alonto Adiong is a Filipino politician and current acting governor of the Autonomous Region in Muslim Mindanao (ARMM). Mamintal M. Adiong Sr. was a long-time Filipino politician, serving as Governor of Lanao del Sur from 2001 until his death from cardiac arrest. Mamintal Alonto Adiong Jr. is the present governor of the Province of Lanao del Sur. Abul Khayr Alonto is a Filipino businessman and lawyer. Samira Gutoc-Tomawis is a Filipino civic leader, journalist, environment and women's rights advocate, and legislator who has served as member of the Regional Legislative Assembly of the Autonomous Region of Muslim Mindanao and a member of the Bangsamoro Transition Commission which was tasked to draft the Bangsamoro Basic Law. Moh Saaduddin was a journalist, peace advocates, and served as a provincial information officer of the province of Maguindanao. ^ Admin. "About Us". FEMAS. Archived from the original on April 18, 2011. Retrieved October 21, 2010. ^ Cayongcat, Atti (1989). Knowing The Maranao. Iligan City: Scorpio Printing, 1986. pp. 12–13. OCLC 30713300. ^ Saaduddin, Deh (February 25, 2019). "Maranao Progenitors". Alkamel Library Philippines. ^ Admin (2006-10-09). "About Maranaos". Maranao Online. Archived from the original on 2010-04-26. Retrieved October 22, 2010. ^ "Muslim Rulers and Rebels (Chapter 2 People and Territory in Cotabato)". University of California Press. Retrieved March 19, 2012. ^ "Welcome". Learn Maranao Language Website. Archived from the original on October 6, 2010. Retrieved October 21, 2010. ^ Madale, Nagasura T. (2010-02-07). "Recipe in the Life of the Maranao By: Nagasura T. Madale, PhD. -Part 2". Kalopindo. Aratawata Website. Archived from the original on July 14, 2011. Retrieved October 22, 2010. ^ Umagang Kay Ganda (2013-07-09). "Recipe: Maranao dish Chicken Piaparan". ABS-CBN Website. Retrieved July 9, 2013. ^ Rosauro, Ryan (2010-10-17). "Munai spice may be way out of war for conflict areas". Inquirer Website. Archived from the original on October 23, 2010. Retrieved October 22, 2010. ^ Madale, Nagasura T. (2010-02-06). "Recipe in the Life of the Maranao By: Nagasura T. Madale, PhD. -Part 1". Kalopindo. Aratawata Website. Archived from the original on July 14, 2011. Retrieved October 21, 2010. Ranao, Ranao (Lake) terms for Lanao del Sur.